I’ll admit it, I’m not a fan of mussels, but my husband is. I originally bought the Mussels for my husband as an appetizer. As I started to prepare them I thought he might like them over some pasta as a meal instead. So this ended up being his meal for dinner. After all, I haven’t been feeling like eating lately, and that’s because(just in case you missed it), Kiley is going to be a big sister! Back to the recipes, I just threw this together as I went a long and it came out really well. When purchasing mussels, make sure you purchase them from a store you trust to make sure the ones you get are alive and well. Don’t eat any that refuse to open after cooking. When you get come from the store, scrub the mussel and then place the mussels into a bowl of cool water with some ice cubes until you are ready to cook them. Melt butter in a large skillet, add garlic till browned. Add half of the mussels, parsley, tomatoes, wine and milk to the skillet. Cover with a lid, I have a glass lid which is nice, because you see when the mussels are opening up. They take about 4-6 minutes to open up, remove open ones with tongs and place a bowl covered with foil. Repeat until all mussels are opened. Remember if some don’t open just throw them out. At some point, start your pasta and cook to al dente. Meanwhile, after all mussels are opened, simmer leftover sauce for about 10 minutes. 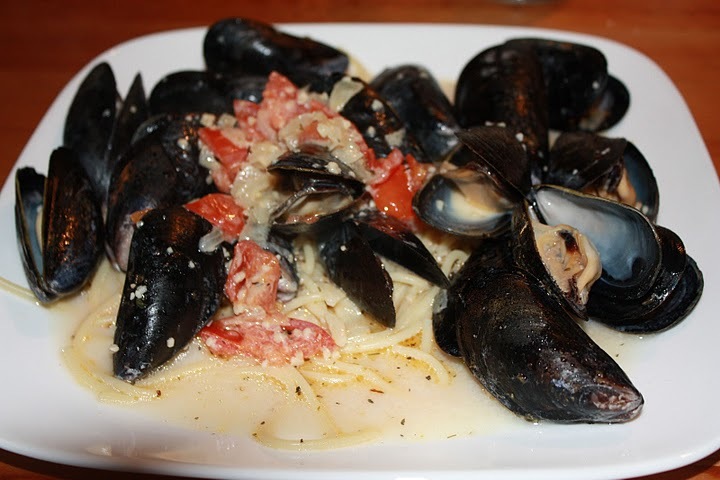 Grab a plate and place some pasta and then some mussles on top, drizzle some leftover sauce on top of all of that! I think I’ve may have cooked scallops once or twice. They are very hard to make because it you over cook them by one minute they start to become rubbery. When I saw this recipe on a blog, I had it saved for a while. I finally made it and it didn’t disappoint. Even though I was a little scared the whole time and my husband kept asking me how long the scallops were in the oven to make sure I wasn’t over cooking them, I did it! I didn’t serve this over a bed of rice as the original recipe called for, as I felt we didn’t need it and I was correct. we were full on just the ingredients of the scallop dish. Heat oven to 425 degrees. Place ramekins on a cookie sheet pan, it’s just much easier. To make panko mixture, place butter in a bowl, add garlic, shallot, prosciutto, parsley, salt and pepper and mix until combined. Add the olive oil slowly until combined. Fold the panko in with a spatula and set aside. Place 1 tablespoon of the wine in the bottom of each dish. Pat the scallops dry with paper towels and place them evenly into ramekins. 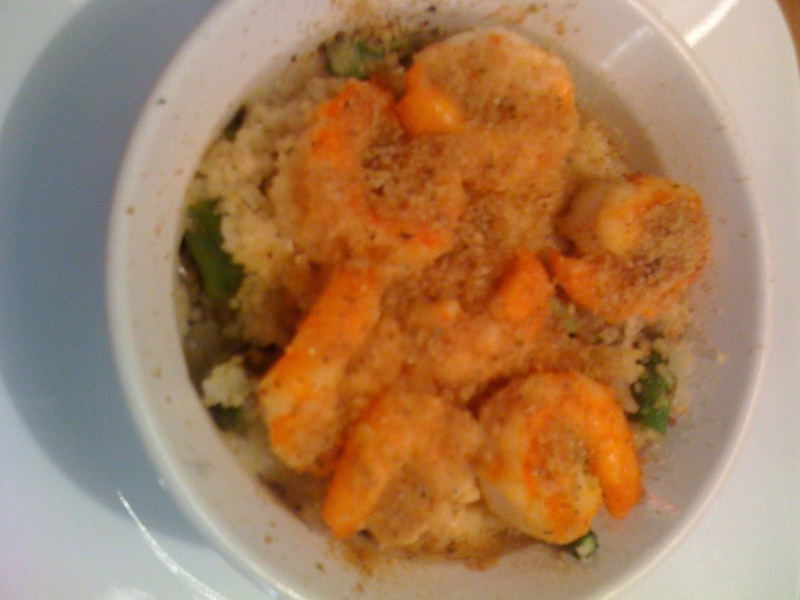 Spoon the panko mixture over top of the the scallops. Bake for 15 minutes until the topping is golden and sizzling . Recipe adapted from Sweet Beginnings, found on A Taste of Home Cooking. With the crisp cool air of fall finally coming to use, I decided I wanted to make some sort of chowder. I looked through my recipe box and found this one that I found in the Family Circle July 2010 issue. It was quite yummy! I love crock pot meals, because you just get them all together and let them cook and give your house a yummy aroma! Combine chicken broth, potatoes, carrots, onions, celery, thyme and old bag in a large oval slow cooker. Cover and cook on high for 4 hours or low for 6 hours. 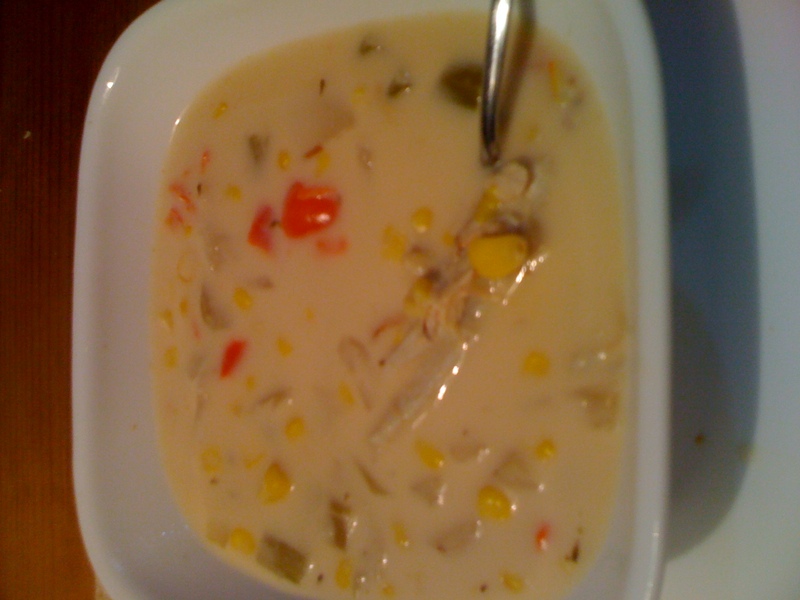 In a bowl stir together red pepper, evaporated milk, corn, cornstarch and salt. Uncover slow cooker and add in stir in red pepper mixture into slow cooker, replace cover and cook on either high or low for one hour. Stir in crabmeat into soup and heat through. Serve warm. Do you love comfort meals? I do, not only are they easy to make after a long day of work, but they just taste so yummy! This has 361 calories per serving. Heat broiler. Line a large baking sheet with foil. Toast your bread for 3 minutes, turning it one time and then set it aside. In a medium-sized bowl, prepare tuna fish with tuna, mayo and mustard. Spread a bit of tuna onto each slice of bread. Top each with a slice of cheese. Return to broiler; heat 3 minutes, until cheese is melted and lighting browned, served open face. I have to be honest with this recipe. I didn’t enjoy it very much. I know some food bloggers would say, then why are you posting this? Well, everyone has different likings and taste. Just because I didn’t enjoy this recipe very much, doesn’t mean someone else won’t. 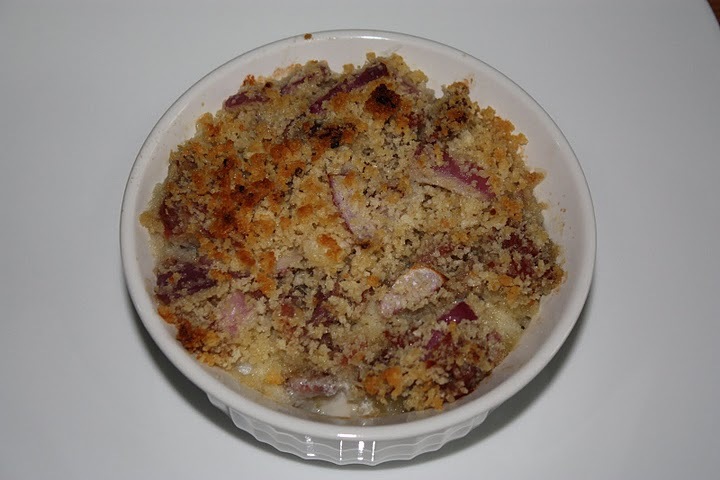 This recipe was adapted from Family Circle, July 2009. It makes 4 servings and has a total of 345 calories per serving. Cook linguine to al dente, about 9 minutes. Add broccoli during the last 5 minutes of cooking; drain. In small bowl, whisk together the broth, soy sauce, ketchup, sugar and hot sauce. Place broth mixture in a large skillet and bring to a simmer. Add scallops and water chestnuts and simmer for 4 minutes, turning halfway through or until cooked through. Remove from heat and stir in sesame oil. Place cooked pasta and broccoli in the skillet and toss with the scallops. Serve immediately. I’m always looking for easy and healthy recipes to make for us for dinner after a long day of work. I saw this recipe in Woman’s Day Magazine, and saved it for a while in my recipe file, but never made it. I’m glad we finally tried it and we liked it a lot. It’s very easy to put together and very yummy! It makes four servings and has 448 calories per serving. Cook pasta as package directs; drain, reserve 1 cup of pasta cooking water. Add a small amount of olive oil in pan and sear tuna, remove tuna, preserve oil and add garlic and stir 1 to 2 minutes until fragrant. Stir in tuna and 1 cup reserved water. Toss with pasta and serve.